Rich Jurek, my co-author on Marketing the Moon, sends us to this awesome video from Hyundai. Stephanie from Houston misses her astronaut father working at the International Space Station. So she and Hyundai cooked up a fantastic message created using 11 Hyundai Genesis cars to share with her father in space. You can learn more about the making of the message here. 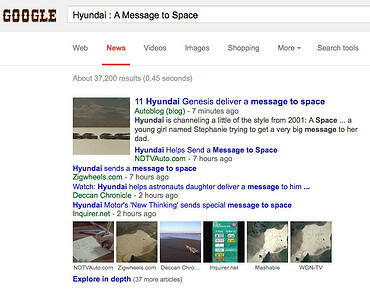 Direct link to the video Hyundai : A Message to Space on YouTube. The well-done video that showcases the creation of the message serves as terrific content marketing for Hyundai. We see the cars on screen for some three minutes! And we're interested in what they are doing. In a world where most car companies spend boatloads of money to advertise on television where few care to watch, this effort stands out. As I write this, it is less than a week since the video was posted and it has over 5 million views. And the media loves this stuff. Dozens other bloggers and members of the mainstream media are talking it up.